Home Blog Which Garage Door Material Is The Right One For Me? 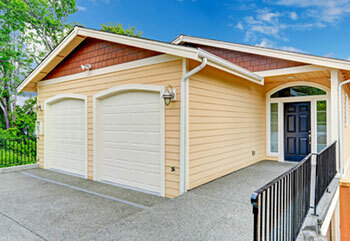 Modern garage door models come in a huge range of colors and materials. It’s possible to find almost anything, which is great - however, this can make it difficult for homeowners to understand what they really need from a new door. In this guide, we talk about the main types of material and what they’re good for. Remember, if you’re considering getting a new door, contact our professional team - you can rely on us to get the job done right the first time. Aluminum is, in many ways, the ideal material for garage door panels. It’s a relatively lightweight metal which is very resistant to corrosion (it won’t rust, unlike steel). It’s also available in large quantities, making it an affordable choice of material. It can be applied with a wide variety of finishes, including faux wood-effect paint. The only downside is that it's not very durable in terms of physical damage resistant. An aluminum garage door would be a great choice for homeowners who don't want to have to do a lot of maintenance. Plastic is the material of choice for many homeowners, and with good reason. It’s very easy to work with, easy to clean, and much lighter than alternative materials. It’s also extremely affordable, which makes it a very widespread garage door material. The main drawback is that if it is damaged it can’t easily be repaired. However, damaged panels can be easily replaced, making it fairly economical to restore a damaged vinyl garage door. Steel is similar to aluminum in many ways; it’s relatively low maintenance and affordable, and can be given a wide range of finishes. It’s significantly heavier, which requires a more powerful (and usually more expensive) opener. It has one major advantage, though. A steel garage door would be stronger than an aluminum one, which means your property will be even safer. There’s nothing quite like the beauty of real wood. The curb appeal this material adds is very significant. Wood is also very strong and durable. However, a wooden garage door requires regular cleaning, sanding and repainting to prevent it from degrading. It can also be much heavier than other metal doors, and can rot or warp if it isn't well maintained. If you're interested in getting a new door installed, there's no one better to turn to than our team.